The red flag with the the eight-pointed white cross is the flag of the Order of Malta’s works. The eight-pointed cross has been used in the Order as long as the latin cross, and stems from the Order’s ancient links with the Republic of Amalfi. Its present form dates back over 400 years; the first clear reference to an eight-pointed cross was its representation on the coins of Grand Master Fra’ Foulques de Villaret (1305-1319). This is the flag flown by the Order’s Grand Priories and Subpriories, its 48 National Associations and over 100 diplomatic missions around the world. It also flies over hospitals, medical centres and out-patients’ departments, as well as wherever the Order of Malta’s ambulance corps, foundations and specialised units operate. The armorial bearings of the Order display a white latin cross on a red oval field surrounded by a rosary, all superimposed on a white eight-pointed cross and displayed under a princely mantle surmounted by a crown (as described in Article 6 of the Order’s Constitution). 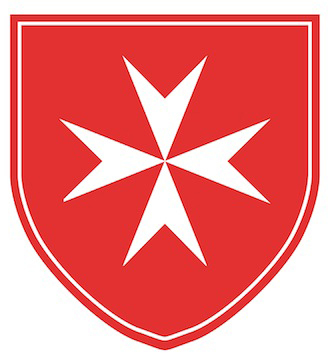 It is the emblem of the Sovereign Order of Malta’s Grand Magistry and its Institutions: the Grand Priories, Subpriories, National Associations and Diplomatic Missions.